Whilst your son/daughter is away, you too can have time to give to other siblings or have a much needed break in the knowledge that your child is being well looked after. When young people are diagnosed with cancer, the effects upon them, their families, their friends, arguably their school and local community are profound. Testimonial evidence confirms that these young people desperately need to meet with peers who are undergoing similar trauma in their lives, relieving the sense of isolation they feel during illness and at such a critical age. The emphasis at The Youth Cancer Trust is upon regular enjoyable activities and improvements in confidence, relaxation with peers and communication. There is no other organisation, charitable or otherwise, which specifically targets this need as its core function. It sounds simple – but it is subtle and much needed. Feeling Nervous about letting your child go? It is natural to feel anxious about letting your son/daughter go away. Perhaps it is the first time they have been away since their illness or maybe it’s the first time away from you ever. You can always telephone the house anytime on 01202 763591 and speak to us. There are also phones in the house which the youngsters can use to call you whenever they want, if they don’t have their own mobiles. We have full Child Protection and Risk Assessment Policies which are available on request. All staff who come into contact with the youngsters have been checked with the Criminal Record Bureau and have enhanced CRB disclosures. If you would like to visit Tracy Ann House prior to allowing your child to stay with us, you are most welcome to do so. We work in conjunction with Macmillan Cancer Relief, CLIC Sargent, NHS and other cancer related organisations as part of the holistic treatment of young cancer patients. All groups are made up of youngsters of a similar age range. All youngsters who wish to come on a holiday must be signed off by their GP or relevant health professional as being fit to come. Youngsters can come before, during or after treatment but must be able to administer medication themselves, as they do when at home. We take also take guests who have been in remission for up to 5 years or who are living with the late effects of having had cancer. You will need to check with your doctor before your son/daughter comes on a holiday. We do not have nursing staff on the premises but full support is at hand if necessary at the local health centre in Westbourne. The Health Centre is less than a mile away and is always on call for us if needs be. Our Chair of Trustees, Tamas Hickish is a Consultant Oncologist at the Royal Bournemouth Hospital and is always available for any emergency or concern over the health of any of the youngsters. We have a strict tried and tested procedure if any youngster falls ill whilst staying at Tracy Ann House. All staff have all been fully trained in emergency First Aid. There are lockers and fridges in each bedroom for medicines. Medication can be discussed in detail prior to the holiday with us. All your concerns can be talked through with either Brenda (Founder and House Manager) or any of the team before the holiday. If your son/daughter does not feel up to any of the activities they are welcome to watch the others – or stay at the house and relax, enjoy our in-house facilities, sit in the garden – or just chill out and listen to music in their bedroom. There is no pressure – Youth Cancer Trust is about freedom of choice and independence. Energy levels can sometimes be quite low for the youngsters who are ill and we are very aware that they might choose not to take part in some of the more strenuous activities – this is absolutely fine and not unusual. They will be well looked after either at the house or they can come along and watch the others. For the siblings it’s quite the opposite! These holidays prove to be of great benefit to the siblings or friends of the patient, allowing them quality time together in a fun environment. Siblings are able to make friends with other siblings and able to share their experiences. 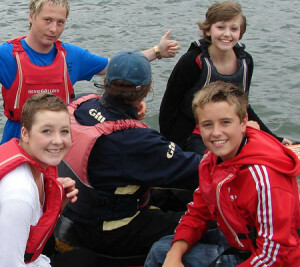 The youngsters are accompanied on all the activities by a member of staff. All the service providers are risk assessed and fully insured. They also have a good understanding of the needs of the youngsters who holiday with us. During the day, activities can include swimming, horse riding, games, go-karting, days at the beach – at our lovely beach hut – and various other choices. Evening activities include a BBQ, Karaoke, a trip to the cinema and sometimes a special meal out. Click here to read more about the activities. When do the holidays take place? The holidays take place all year round. Groups of 8 stay each week from a Monday through to the Friday. We can pay for your travel expenses. Car – Parents are very welcome to bring their children to Tracy Ann House or if the child is of age and has their own car they can drive themselves. Train – Salisbury, Bournemouth and Poole station are local. We can arrange a pick up from these stations. Coach – There may be a group travelling from your area to Bournemouth – please contact us. Plane – Bournemouth Airport and Southampton Airport is 1 hour away. There are domestic flights from all over UK to here. We can also arrange to pick up and drop off from Gatwick Airport in London.